What makes you and the growth of your business unique? 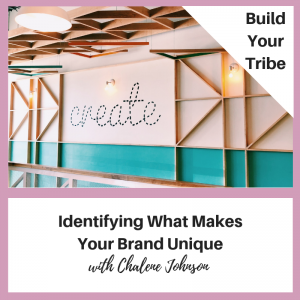 In this episode, you’ll learn all about building a brand that is one of a kind and creative. It’s time to stop comparing yourself to others who have “already done it” and do it yourself YOUR way. What makes your brand personality unique usually isn’t something outrageously different from what you’ve already been doing. Learn some tips on how to identify what you can supplement to your brand. Your brand is often made up of a collection of things that make you who you are. What makes you unique, is a collection of not very unique things compiled together to make you unique. This collection is what makes you, and especially your business, attractive. I hope this episode was helpful for you and that they have made this topic a little less scary and intimidating. These words should be a good push for you to do something different that isn’t necessarily extreme, hopefully by listening in you’ll find out what that “something different” is for you and your business. Follow me on Instagram @ChaleneJohnson, Subscribe to Build Your Tribe, Take a Screenshot, and Share it with me in IG. I would love to personally thank you for becoming a part of the podcast fam!